The Measles Rubella vaccination campaign has been going on smoothly without any hiccups in Hailakandi district. Hundreds of ANMs and other health functionaries have fanned out to different parts of the district to vaccinate school going children in MV, ME, LP and High Schools across the district. There will be over 1,400 school session sites to be completed in two weeks’ period. 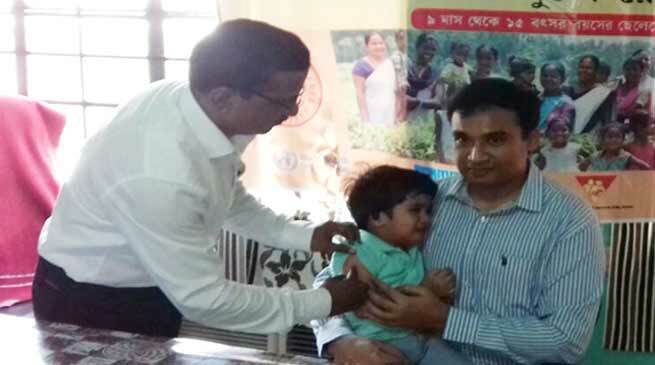 To drive home the safety and efficacy of the vaccine, Deputy Commissioner Adil Khan took his two-year old plus daughter Aiza Khan to the SK Roy Civil Hospital for vaccination. On completion of the vaccination, she was given a certificate for taking MR vaccine successfully. In some minority concentrated areas, there were reports of low turn out but the vaccination drive has not hit the wall, thanks to the painstaking efforts of the district administration and health authorities to prevail upon the Muslim clerics to convince their community to take to vaccination to protect their children from the viruses. To drive home the message that the vaccine is highly safe and effective and there is nothing to fear or worry about, Joint Director, Health Services, Dr. Avijit Basu took the vaccine to convince the people of the minority community. And that changed the perception and what followed was quick response!